Each month, Foodist ships an exclusive selection of international delicacies to its customers for € 24 (including shipping). The Foodist box surprises subscribers each month with its assortment of products and enables them to discover exclusive gourmet products. The value of the goods in the monthly Foodist boxes surpasses at least 30€. You are what you eat! In Germany, the trend to eat well persists. More and more people are willing to spend more money on high-quality groceries. We want to shape the growing market for high-quality groceries by means of our Foodist box, for it is our goal to find the best gourmet products for our customers. The Foodist box subscription is at the heart of Foodist. Our subscribers receive a monthly box containing 6-8 delicacies at the 15th of each month and may eagerly anticipate the next gourmet surprise before that date. The box is available for € 24 a month (including shipping) and may be canceled monthly. The total value of the products is at least € 30. The focus, however, is not on saving money. Instead, the Foodist box is intended to surprise customers and help them discover high-quality groceries. Our subscribers may look forward to extraordinary delicacies from Germany and other European countries selected by us each month. In each Foodist box, we include a magazine that explains the characteristics of and stories behind the producers selected. Customers may then reorder the individual products in our delicacy shop. In May 2013, we completed our first financing round on Companisto, raising € 175,000. Since then, we have not received any additional capital but have grown by means of our cash flow. 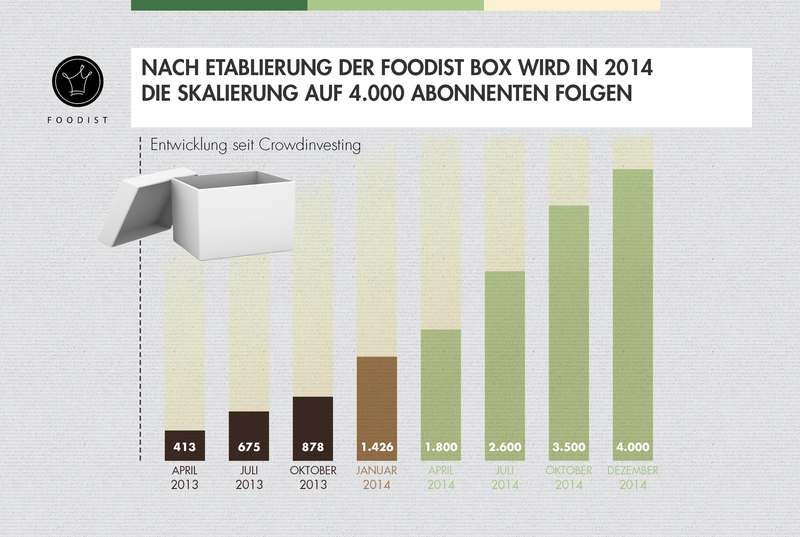 Back then, we counted 350 Foodist box subscribers and generated monthly revenues of € 9,600. Both the number of subscribers and the monthly revenues have increased fourfold since the first equity-based crowdfunding! At the moment, we have 1,600 subscribers and have generated monthly revenues of € 45,000 in February 2014. We will finish our first business year (2013) with gross annual revenues of € 304,000. If one considers only the last 12 months, our cumulative revenues even exceed € 381,000. In May 2013, the average subscription period of our Foodist box customers was 4 months. We were also able to more than double this value. On average, Foodist box customers now keep their subscription for 10 months. This value will continuously increase in the future because we will improve our service and because there are already many subscribers who have kept their subscription for more than 10 months. At the same time, we have been able to decrease the monthly churn rate from an average of 7% to 5%. This success is due to the precise analysis of the feedback form. In total, we have shipped almost 20,000 boxes containing more than 100,000 products since the launch of Foodist. Because of our automated feedback systems (each customer receives a feedback form from us with each box), our Foodist box subscribers have answered more than 13,000 feedback questions. We meticulously and continuously analyze the direct customer feedback and the information gathered, which enables us to regularly increase all important key performance indicators. Since the feedback from our customer helps us understand them very well, we are able to adapt the assortment of products in the box to their wishes and focus on the demand. Because of the increased customer lifetime value (contribution margin realized by a customer during the entire „customer life“), we may now increase our budget for customer acquisition considerably. At the moment, the customer acquisition costs are approximately € 12, and the profit per subscriber amounts to € 53. As a classic subscription model, we calculate the profitability of our customers by means of the contribution margin. Each month, we generate guaranteed revenues of € 24 because of the subscribers. After the costs for the products, shipping, packing, handling, and taxes have been deducted, an income (contribution margin) of roughly € 6.50 per month remains. The revenues and the contribution margin per subscriber increase due to reorders of individual products from the Foodist box and due to the additional sale of thematic Foodist boxes such as the Ladies’, Gentlemen’s, or Snack boxes. Our customer acquisition costs are currently at approx. € 12. Consequently, the contribution margin in the first month of the subscription is still negative. As early as in the second month, however, a customer is profitable for us, which makes our business concept very scalable. Thus, each additional month ensures an additional profit. This value will still increase significantly because there are many customers who have already been active for more than 10 months. Because of a further improvement of the contribution margin per box and of the customer lifetime value, the profit per subscriber will keep increasing. We already ship Foodist boxes to anywhere in Europe each month. Shipping outside of Germany was originally due to individual inquiries from the respective countries. This year, we want to adopt a proactive approach to internationalizing the Foodist box. In this regard, we have already found a powerful partner in Ernst Eskildsen from Denmark, who is preparing the development of Foodist in Denmark with us. Foodist will probably found a subsidiary in Denmark, in which Foodist Germany will be a majority shareholder. 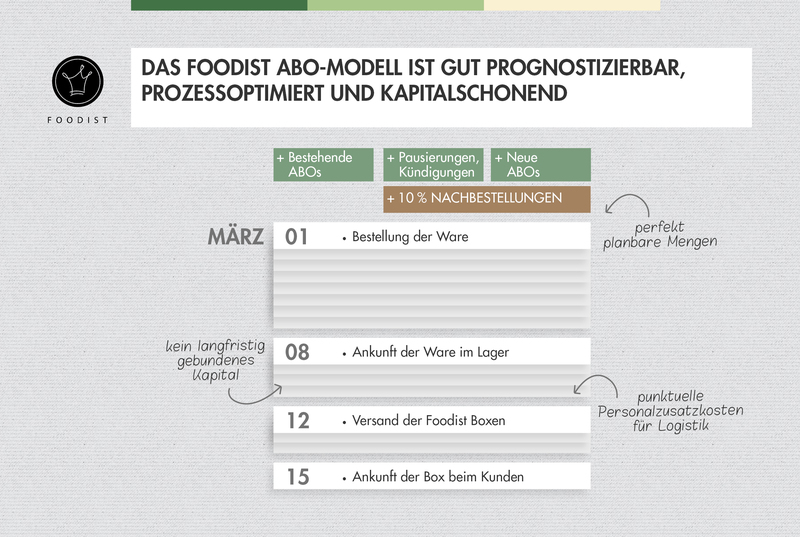 The Companists participate in Foodist Germany by means of the equity-based crowdfunding and thus profit from the internationalization as well. In Denmark, many people are willing to pay high prices for high-quality groceries. Compared to Germany, the general price level of groceries is higher in Denmark. Moreover, the Danes have an affinity for ordering groceries online. Ernst Eskildsen was one of the directors of the Danish company Aarstiderne (www.arstiderne.com), which is the market leader in cooking boxes in Denmark. While he was working there, the company shipped 120,000 boxes each month and generated annual revenues of more than € 30m. Foodist Germany will also benefit from his experience. Because of the internationalization, we will achieve cost degression effects for labor costs because areas such as product scouting, purchasing, logistics, IT, and design may be controlled centrally from Germany. Therefore, the teams in Denmark and Austria may focus primarily on marketing, which is controlled locally in addition to customer management. With regard to the products in the Foodist box, these will be 70-80% identical to the contents of the German box in Denmark and 100% identical in Austria. Moreover, the boxes will initially still be shipped from Hamburg, and we have been able to negotiate very good international terms with our logistics partners (Hamburg is an international logistics hub). Our partners in Denmark and Austria may also use the existing IT structures of our shop and the design. In April/May 2013, our first equity-based crowdfunding round on Companisto took place. Back then, our expectations were exceeded by far. In 29 days, we were able to reach our maximum funding limit of € 175,000. At that time, 566 Companists participated in the then second largest equity-based crowdfunding in the history of Companisto. We were able to benefit very much from this investment. In addition to the capital, we have particularly received valuable feedback and impressive support from our Companists the entire time. They were very important multipliers for customers, producers, and cooperators. Furthermore, we are still receiving many inquiries from the press, cooperators, or potential applicants because they have seen our profile on the Companisto platform. We intend to use the capital to promote the internationalization of Foodist, to further expand our customer base, and to fully exploit the potential of the B2B market. Another important argument for the second equity-based crowdfunding round, we think, is that Companisto and all Companists of Foodist believed in us at a very early stage. The existing Companists are also supposed to profit from our growth now and to be able to participate again. Also, we want to provide new Companists with an investment opportunity, for Companisto has grown significantly since our last equity-based crowdfunding campaign as well. Since we want to start promoting our internationalization this fall, the internationalization of Companisto also motivates us. We hope to expand our network in other European countries by means of international investors on the platform. 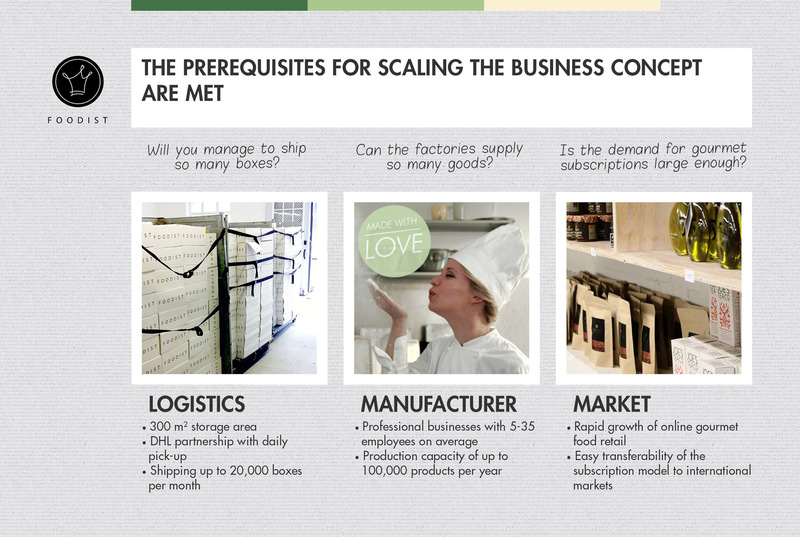 The foundations for scaling our business concept were laid last year. In the logistics department, we have 300 m² of storage space at our disposal, where we are already able to pack up to 20,000 boxes each month with one employee and one marginally employed person. Our logistics partner DHL also guarantees us the daily pick-up of our packages. With regard to the supply capacities of our producers, we can say that quantities of several thousand items do not pose a challenge to their production. The producers professionally operate their business with 5-35 employees on average and may add employees on a short-term basis if required by higher quantities ordered. Delivery periods from factories abroad to Germany, for instance, are 1-3 weeks after the receipt of the order on average. The share of online grocery retail in total grocery retail in Germany will increase to 2.5 % in 2015 according to McKinsey & Company. This would correspond to revenues of € 4.4bn. Apart from this, the Foodist box subscription model can easily be transferred to international markets. What Do You Intend to Do after This Equity-based Crowdfunding Round? After more than a year of experience using the subscription model, we know the decisive key performance indicators, the average subscription period, and the customer acquisition costs and have simultaneously identified the efficient marketing channels. Based on this market expertise and by means of the funding, we will scale the number of Foodist box subscribers to up to 4,000 monthly subscribers until the end of the year. Because of the 1,600 Foodist boxes we currently ship each month, we have achieved a powerful position on the German gourmet market. We may also use this position when it comes to testing the introduction of new gourmet products to the German market. By means of customer feedback and reorders in the shop, we receive sufficient information in order to predict a tendency as to which products will sell successfully on the German market. This information is extremely relevant to a multitude of producers searching for suitable markets for their products. Since we are often the first retailer in Germany to offer the products, we are able to secure the right to exclusive distribution at an early stage. In the future, we will sell the best-selling products to gourmet shops, hotels & restaurants, and select supermarkets. Foodist will thus also start accessing the lucrative B2B market for gourmet products. Consequently, over the long term, we will profit from the fact that we conduct the market launch of the products by means of the Foodist box. Thus, we also satisfy the need of the producers to cooperate with us after the market entry through the Foodist box, for the (foreign) manufacturers are also constantly looking for partners who may introduce their products to the German market. The concept is extremely simple: Subscribers of the Foodist box receive an assortment of exclusive delicacies that are hardly available in Germany on the 15th of each month. Subscribers do not know the exact contents of the box until they open it. The Foodist box costs € 24 including shipping and contains 6-8 delicacies with a total value of at least € 30. The Foodist box subscription has no minimum duration and can be canceled monthly until the end of the previous month via email or phone. The Foodist box is intended not only for one’s own pleasure but also for the use as an extraordinary gift. Our customers use the Foodist box as a creative gift for events such as birthdays, Christmas, weddings, or business anniversaries. They are able to choose the start date and the duration of the gift subscription themselves and to include an individual greeting to the recipient in the form of a printed greeting card. The advantage for us is that our customers are willing to pay in advance. When they purchase a gift subscription, we receive an advance payment for the entire duration and then subsequently provide our services each month. The delicacies in the Foodist boxes are always a novelty to our subscribers. Many of our customers are so excited by the selection that they want to reorder individual products from us. For this purpose, we offer the Foodist delicacy shop. In the delicacy shop, Foodist customers may reorder individual products as they wish. They may thus create their own boxes or simply reorder certain products. Nowadays, approximately 1,500 individual products are reordered through the delicacy shop each month. This also pleases our producers because they may develop a sustainable business relationship with Foodist after their products have been introduced through the Foodist box. In addition to the monthly Foodist box, we assemble thematic boxes that change every season and that our customers may purchase separately. Our customers use the thematic boxes both for giving them away and for enjoying them themselves. The boxes may roughly be divided into three areas: special events, seasonal topics, and thematic boxes related to a certain category of groceries. For special events such as Christmas, Easter, or Valentine’s Day, we have already offered thematic boxes very successfully. Seasonal boxes, for instance barbeque or picnic boxes, have also been received very positively by our customers. Our thematic boxes like the Gentlemen’s Box, the Ladies’ Box, or the Snack Box have become part of our permanent offer. In order to provide our customers with additional inspiration apart from our own offer, we have already successfully launched thematic boxes together with our partners. The advantage of cooperation boxes is that both the partner and Foodist can encourage their customers to purchase the box. The cooperation box with HelloFresh, for example, was a huge success and was sold more than 500 times. Right now, we are offering a wine box together with Sommelier Privé. In addition to the consumer segment, the corporate customer segment is becoming increasingly important to us. We use our thematic boxes as a basis for the acquisition of corporate customers, which use the thematic boxes as a gift to customers, service providers, or employees. Upon customer request, we also assemble individual boxes that are tailored perfectly to the purpose of the gift. In the first year, we already acquired more than 30 corporate customers. The acquisition of corporate customers can serve as an important multiplier to Foodist, for it causes many recipients to get in contact with Foodist at once. In the corporate customer segment, Christmas sales will remain highly important, but we have already acquired several corporate customers who purchase our boxes all year round. These customers include, for instance, News Aktuell (a German press agency), FPS Catering, Marquart Küchen (a German seller of kitchens), and Reemtsma (a German tobacco company). 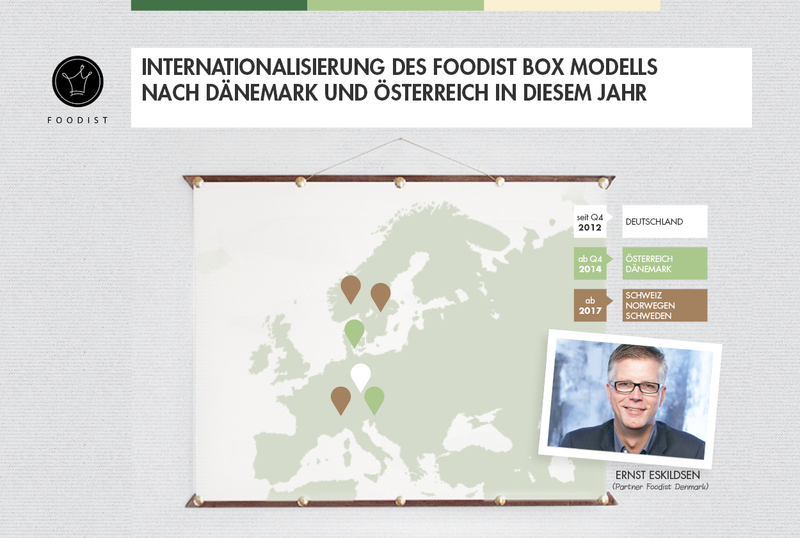 In 2013, we generated the largest proportion of our revenues by means of the Foodist box (58.3%), followed by the revenues from thematic boxes (18.6%) and the B2B customers (12.2%). For 2014, we are expecting revenues to shift further toward the B2B segment. Naturally, however, we also intend to increase revenues in the other segments. We generate our revenues through three different channels. The main channel for generating revenues is the monthly subscription fee of € 24. Additional sources of income are reorders of the individual Foodist products in our online shop and gift boxes that we assemble based on the season. Our main source of income is the monthly fee of € 24 for the Foodist box subscription and Foodist box subscription as a gift. The Foodist box subscription may be canceled at the end of each month, and the fee is debited from the customer’s bank account monthly. In the case of the Foodist box as a gift, the subscription period is determined beforehand, and the payment is made immediately. Thus, we achieve a clearly positive cash flow in the case of the Foodist box as a gift, for we do not have to ship the monthly gift boxes until we have received the payment. If, for instance, somebody gives the Foodist box as a gift for 3 months, we only have costs of € 17.50 for the shipment of the first Foodist box during the month in which the customer makes the payment. Our income, however, is € 72 immediately. Since we order high quantities from the individual suppliers for the Foodist box, so-called quantity degression effects result. We always receive the maximum discount from the manufacturers. Often, our purchase price is even below the wholesale price. While normal retailers in the gourmet segment may estimate a margin of 30-40%, our margin is partly 60-70% during our purchases for the Foodist box. In all other cases, our margin is still 50% on average. Moreover, manufacturers become aware of the marketing effect of increasing product awareness by means of our far-reaching media such as Facebook (6,660 fans). By means of the Foodist box, manufacturers are provided with a platform on which they may reach 1,600 people who have an affinity for gourmet food and are very willing to pay for high-quality groceries. Perfectly Predictable Quantities: Our customers may cancel their subscription until the last day of the previous month. Therefore, we always know at the end of a month how many boxes we will ship the next month. Only then do we order our delicacies, so we only have a large stock of goods for a short time and thus prevent non-current assets. Because of the subscription model, we suffer less from negative seasonal fluctuation than other retailers. Of course, our growth will always be less rapid in summer because many customers are on vacation, but we always retain a large number of subscribers who guarantee minimum revenues even in hot months. Some other e-commerce retailers suffer from losses of up to 40% in summer. We aim to increase the profit that we generate by means of each subscriber we acquire by generating additional revenues from each customer through additional orders such as thematic boxes and by improving the contribution margin of the Foodist box. The contribution margin per box will increase due to the increase in orders because our costs for product purchasing, packing, and shipping will continue to decline. In order to increase the total revenues from a subscriber, we have different levers at our disposal: First, we want to further improve our service and convince our customers to remain subscribers in case they want to cancel their subscription. In so doing, we will increase our average customer lifetime value (the contribution margin realized by a customer during the entire “customer life”). In addition, we want to provide more incentives to purchase thematic boxes and individual boxes in the future so that we will increase the revenues from customers beyond the scope of the subscription. In the near future, we intend to introduce a premium subscription that will cost € 30 a month. Apart from one item, the premium box will be identical to the normal Foodist box. This additional item will be a particularly precious product like whisky, expensive wine, or balsamic vinegar. By means of this subscription, we want to increase both the revenues and the contribution margin per subscriber. In order to permanently distinguish ourselves from our competitors and to leave them behind, we must steadily improve both the products and the processes behind them. As the first German provider of gourmet box subscriptions, we surely have a first mover advantage, but we do not want to rest on our laurels. On the product level, our unique selling point is the exclusiveness of the products. Whereas our competitors partly include industrial products in their boxes or include similar products in subsequent boxes, we attach a lot of importance to product scouting. As of now, more than 100 producers are our partners, and this number increases every month. Consequently, we do not have to use the same producers or product categories twice in consecutive months. Particularly in the case of international producers, we are often the first German company to order the products. We thus achieve maximum exclusiveness and are not bound by competition in our pricing. We have already enabled more than 20 producers to enter the German market. In addition, we have a circle of 10 international manufacturers who create new products with us and initially produce them solely for Foodist. In addition to product selection, we attach a lot of importance to design and branding. For instance, we produce professional photos and high-quality brochures for each box and thus present the individual delicacies and the related factories in a detailed manner. Since we pay a lot of attention to detail, we are establishing Foodist as a high-quality brand from the beginning. Apart from improving our product, our focus is on optimizing our processes.We have developed an internal logistics process on 300 m² storage space that can handle up to 20,000 shipments per month. As a result, we are growth-oriented from the beginning and are able to highly scale our business concept. The early establishment of an optimal logistics process was possible because of our managing director Andreas Brandt, who had already designed and successfully implemented a similar logistics process in 2012. Another unique selling point is the area of business intelligence. We possess detailed analyses of our customers and may thus not only improve our product permanently, but also increase revenues by means of personalized marketing. With regard to product improvement, the feedback form is particularly helpful for us because already 15-20% of customers return it. In our analyses, we are now able to filter the customer lifetime value based on different marketing campaigns, customer groups, or regions and thus achieve more targeted marketing. Moreover, we can address customers who often or mostly reorder the same product categories by means of newsletters containing personalized offers. 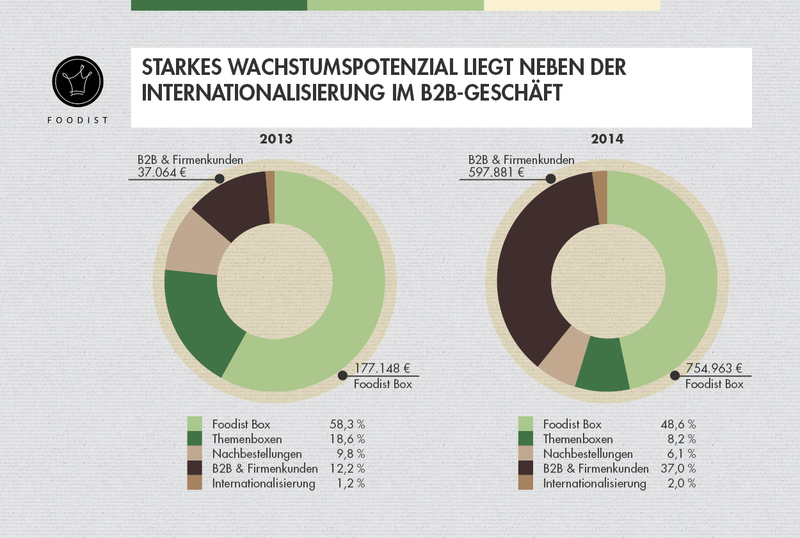 The gourmet product market in Germany is very fragmented, so there are only few major competitors. The majority of grocery subscription providers offer so-called cooking boxes, such as Hellofresh, Kochzauber or Tastybox. However, these focus mainly on facilitating everyday life by means of predetermined recipes. In other words, their customers receive ingredients and recipes but no delicacies. At Foodist, on the other hand, the focus is on something else: trying and enjoying high-quality products. In addition to the cooking boxes, there are several providers of special subscriptions, for instance a wine subscription, a meat subscription, or a chocolate subscription. We do not consider these companies our direct competitors either, for they often address only a small, specific target group. After we launched our business as a first mover in gourmet product subscriptions, there have been two main competitors who adopted our business concept: Gourmetbox and Delinero. Gourmetbox was launched after Foodist and, in contrast to Foodist, only ships its boxes every two months. The exclusiveness of the products cannot compete with the selective product choice of Foodist either. The Gourmetbox, for instance, contains products such as Oryza rice, which is also available at German discounter Netto, or spirits by brands such as Berentzen or Puschkin. Foodist, on the other hand, focuses deliberately on carefully selected products by select producers. In so doing, we aim to surprise our customers over and over again by means of high-quality products that cannot be found on the shelves of a supermarket. Delinero started as a marketplace for gourmet products. This means that customers order products on a platform and then receive them directly from the respective producers. Right now, the company uses the platform to test different models, for instance a wine subscription or a delicacy subscription or kitchen equipment. The focus, however, is still on the marketplace, which is why subscription numbers significantly lower than those of Foodist can be expected. The target group accuracy of contents and the frequency are the decisive factors in the performance of newsletters. The open rate of our newsletters is above 45% and is linked to an average click rate of more than 10%. By now, we also divide our customers into groups based on their favorite products and send them individual offers. Cooperation agreements with Hello Fresh, Bitebox, Sommelier Privé, or Armed Angels are another extremely cost-efficient marketing channel because we do not have to spend money on service providers and can cooperate directly with the other brands. Simultaneously, we achieve high conversion rates with regard to the acquisition of new customers. The campaigns are mostly based on joint newsletters, mutual box inserts in the case of orders, Facebook lotteries, or the joint sale of a box, e.g., the box for which Sommelier Privé selected the wine matching our snacks. The most cost-efficient marketing channel is word-of-mouth marketing. After their purchase, we ask customers how they have found us and receive the answer “through direct recommendation by friends and family” in 25% of all cases. We foster the recommendation of Foodist by means of “customers recruit customers” campaigns, during which the recruiter and the new customer are rewarded with a bonus. Our own Facebook page with its more than 6,600 fans as well as countless external food and lifestyle blogs serve as the foundation of our social media marketing. Moreover, the monthly unboxing has already become a tradition. Many customers share pictures of their unpacked Foodist box and provide us with direct feedback in regard to the assortment. Bloggers serve as important commentators and multipliers. Therefore, we ship our Foodist box to several select blogs each month, which may then test it and report on it. The respective readers of the blog receive a gift card code when they publish a post so that we can measure the success of the blog post by means of the number of gift cards redeemed. Consumers in Germany, Austria, and Switzerland increasingly purchase their groceries online. Compared to 2011, the proportion of German consumers who use online food retail services has increased from 18 to 27 percent in 2012 according to AT Kearney. At the same time, annual revenues from grocery sales on the internet have increased to € 500m. Given that total revenues in grocery retail amount to roughly € 200bn, this corresponds to a proportion of only 0.2 to 0.3 percent. Renowned studies, however, predict an enormous potential for growth of the German online grocery market. According toMcKinsey & Company, the share of online grocery retail in total grocery retail in Germany will increase to 2.5% in 2015. This would correspond to revenues of € 4.4bn. The current development perfectly plays into the hands of the online sale of the Foodist boxes. Our customers come from different age groups, regions, and professions. Nonetheless, we naturally have a core target group. Our core target group tends to be female (64%), approximately 30-50 years old, and holds an academic degree. Our target group is mostly from urban regions; approximately 24% of the customers are from Berlin, Munich, and Hamburg alone. There are, however, many customers in rural areas as well. The German federal states with the largest proportion of customers are Bavaria and Baden-Württemberg. In those federal states in particular, we have many customers in rural areas. We have deliberately kept the price barrier low in order to reach a larger target group than we would have if we had positioned ourselves in the luxury segment. Together with his co-workers in the warehouse, Diana and Franziska, Andreas Brandt (co-founder and managing director) ensures that customers receive their orders on time and undamaged. Even at peak times, when more than 1,600 Foodist boxes are packed and shipped within three days, the logistics trio is nowhere near its maximum capacity. In addition, Andreas contributes highly valuable contacts with our corporate customers to the company and has simultaneously rediscovered his meticulous side with regard to organizing the accounting department. The founder and former managing director of the popular Landgut Wulksfelde (www.gut-wulksfelde.de), a manor on the outskirts of Hamburg (annual revenues of more than € 12m), and of the B2B delivery service Cityfarming (www.city-farming.de), he supplements the online expertise of his young and dynamic business partners with his entrepreneurial experience. Alexander Djordjevic (co-founder, managing director) contributes five years of experience working for the German coffee and confectionery retailer arko, where he already completed training in marketing and communications prior to his work-study program at the Hamburg School of Business Administration, to Foodist. The creative head of the company, he is responsible for marketing and corporate communications. Apart from dealing with marketing plans, he lives his passion for sales at Foodist and is almost constantly on the phone. Ole Schaumberg (co-founder, managing director) not only reveals his strategic qualities while playing poker, but also contributes his experience in business strategy gained at the OTTO Group and the venture capital company e.ventures. He is the master of numbers in the departments of financial controlling and business intelligence and the product scout of Foodist. Between calculating and feasting, he also works on improving the various processes at Foodist. We owe our impressive corporate design to Julia, our creative director. There is no food blog she does not know and no picture at Foodist that was not edited on her graphics tablet. After her training in media design at OTTO Group, she worked in the network of the advertising agency TBWA and gained her first start-up experience at kleidoo.de. In the summer of 2013, Kathrin and Linda started their training in our company to become management assistants in marketing and communications and have become pillars of Foodist since then. Linda, who already completed her studies in graphic design, is responsible for corporate customers and serves as editor-in-chief of the monthly Foodist magazine included in each Foodist box. Kathrin is both the voice and the youngest employee of Foodist. She manages customer support and is our connection to social media marketing and to the blogosphere. We have also strengthened our company structure in the last months. Now, we have two supplementary advisors who counsel us with regard to our strategy. Among other things, Georg Schweisfurth is the founder of the organic supermarket chain basic AG (www.basicbio.de), which is among the three large retailers of organic products in Germany with its 25 branches and its annual revenues of € 111m. His retail expertise is especially valuable to us in regard to sales and marketing decisions. Our second advisor, Dr. Hans Joachim Winterling, actively shares his knowledge of finances and financial controlling with us. The former head of financial controlling at K+S AG (www.k-plus-s.com/en/about) and former CEO of COMPO group, he is experienced in company sales to private equity companies. In addition, the consulting company Ernst & Young (www.ey.com) advises us with regard to legal, tax-related, and business-related issues in the context of the start-up program, which is offered to only a few select start-ups. What Is the Current State and What Will Come Next? Reached 1,600 monthly subscribers in March 2014 (after 18 months on the market). How Is the Capital Raised through Equity-based Crowdfunding to Be Used? How Can Companists Support Foodist? We increasingly address gourmet shops, hotels & restaurants, and individual supermarkets with our choice of international delicacies. No matter if you are thinking of candy bars, nut mixes, or crackers, can you think of shops where Foodist gourmet products would be appropriately placed? Like, share, comment...we are very active on Facebook and Instagram and are grateful for any kind of participation on your part. Like our Facebook page or recommend it to your friends and help us spread the idea of Foodist. Regardless of whether you find them on weekly markets, blogs, or trade fairs, you certainly know excellent gourmet products that meet the high standards of Foodist. We take personal product recommendations from customers very seriously and are grateful for any suggestions.